It has now been just over a month since Sangoma acquired SchmoozeCom, the sponsor and lead developer behind FreePBX, and we’ve consciously chosen to wait a few weeks before reaching out to you, in order to provide reassurance that it’s “business as usual” for FreePBX, the project that you know and love! And it now seems like the appropriate time to offer you a warm welcome from Sangoma, where I have the honor of being the President and CEO. Many of you may know Sangoma as a well-established, highly respected technology company that makes products for many aspects of the telecom industry. We are financially stable, publically traded, with operations all around the globe and a formidable engineering team with deep expertise in telecommunications, developed over many decades. In recent years, Sangoma has been focused on introducing new products and services to the market including call center software, gateways, tapping/call recording software, session border controllers, SS7 software, high density telephony cards and many others, so adding a PBX is a logical strategic fit. How better to do that than with FreePBX, perhaps the most widely used PBX on the planet! What you may not know is that Sangoma also has a long pedigree in Open Source telephony, having supported many of the most important OS telephony projects in our industry, including both Asterisk and Freeswitch. In fact Sangoma helped make Asterisk dependable for business many years ago, and has contributed to helping FreePBX become one of the most widely adopted open source PBXs on earth. We know very, very well that in other cases, when a commercial company has taken over an open source telephony project, it has not always ended well, and that this may concern some of you slightly. Heck, we at Sangoma have been caught up in those situations too. So one of the most critical points I wanted to share with you today is that you need not worry about such problems in this case! Sangoma is honored to now be the steward for the FreePBX project and has partnered with and retained all of the people at Schmooze who work on FreePBX. They are very excited to be part of the Sangoma family now, and together we are 100% committed to not just maintaining but evolving the open source project on your behalf. You have my word on that. The acquisition will enable acceleration in the development of FreePBX (and SIPstation) capabilities, via both additional financial investment into the project and by tapping into the deeper pool of engineering resources available at Sangoma. This means more functionality in FreePBX, sooner, for you. All of our products/services, including FreePBX, from the open source project, to Commercial variants of FreePBX for those who require this option, to our add-on modules, to SIPstation will be more readily available from Sangoma’s extensive network of distribution partners around the world. This will make it easier to obtain the software through not only the traditional Schmooze methods but now also from Sangoma and its channel partners around the globe. You will be able to count on the industry leading reputation of Sangoma’s “because it must work” products to interoperate even more elegantly with FreePBX. A simple example would be our full range of telephony interface cards or the integration of Sangoma’s SBC functionality into FreePBX, with many more possibilities to come. 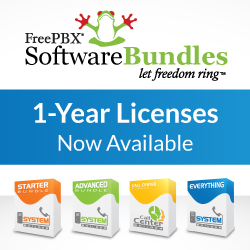 For those users who have asked for a Sangoma PBX, we can now meet that need with FreePBX, in the traditional downloadable open source variant, or pre-installed and tested on our industry leading ‘because it must work’ telecom appliances. I hope you will agree that these are exciting times for FreePBX and its enormous group of over 2 million users around the globe. If you have any questions, concerns, ideas, or requests, I invite you to contact me personally at the address below. Please don’t hesitate to do so, as I would welcome the input from our valuable community! Myself and everyone in the Sangoma/Schmooze/FreePBX family offer you this warm welcome and hope you’ll find this new partnership only serves to further your satisfaction as a FreePBX user. Previous PostPBX M3 Wins Best Large Enterprise Solution at ITEXPO, OBIHAI phones now support Phone Apps, OTTS, Expanded Bundles, Enterprise Mobility, FreePBX Add-ons, and Allison Live!